​If you’re looking to get a new thermal weapon sight you might find out the hard way that there’s a ton of conflicting information out there. The technology is still pretty new and as such you also often can’t get a ton of help from anyone. We’ll try to shed some light into the area of thermal weapon sights. At the end you should know what kind of options you have and be able to make an educated decision which of the sights you want to buy. How did they get developed? It’s easy to imagine where those thermal sights came from. They originally were developed for the military and initially were deemed top secret. Over the years they have made their way into the consumer market and have been picked up by some hunters with deep pockets. They have become more affordable which also resulted in higher sales and more widespread usage for hunting. At this time nearly all thermal sights are equipped with a mounting system that allows for quick detaching. These systems are designed to work with either standard Weaver or Picatinny rails. This allows to mount these systems on pretty much any rifle available. It also allows to quickly take the sight off so you can replace it with an optical scope for daily use. What types of Thermal Weapon Sights are there? Today you can overall find two different kinds of Thermal sights. First, you have a design that functions like an optic scope except that it works with a thermal sensor. The alternative is a sight that leverages your optical scope and attaches to it. 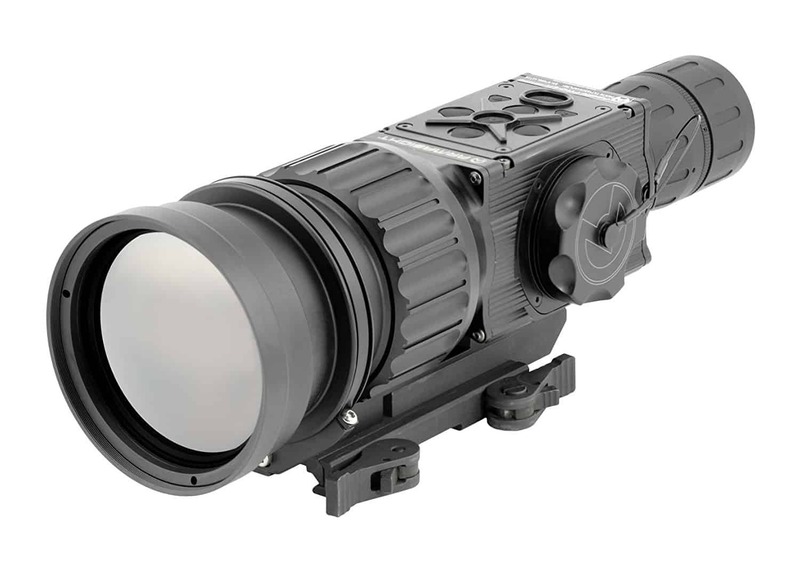 These are also called primary thermal imaging optics and have basically the same design as an optical scope. You have a reticle that is superimposed onto the thermal image. That usually results in you being able to pick whatever reticle you prefer ranging from standard crosshairs to Mil-Dot and other types. These primary thermal sights are overall very accurate. However, when you want to shoot during the day you have to take the sight off and then remount it the next time you use the rifle during darkness. It’s easy to see that this can cause issues with accuracy if the scope is mounted just slightly off. With high quality mounts it shouldn’t be an issue. For tactical applications you do want to consider not to unmount the sight at all to ensure that it keeps its accuracy. These sights attach to your existing telescopic scope. They can either attach to the front of the scope like the Armasight Apollo-Pro (from FLIR) or being the scope like the NiteSite Nightvision scopes. In both cases you use the reticle of your existing optics instead of using any imposed reticle of the thermal sight. 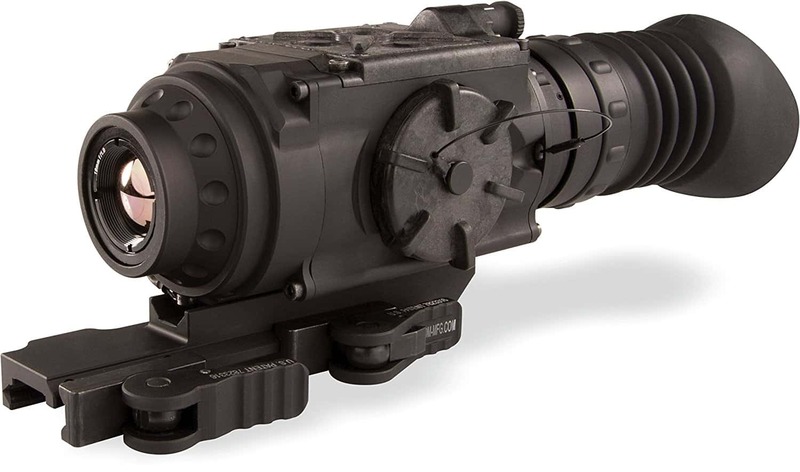 Front mounted sights take the thermal image and then funnel it through your daytime optics. This does remove the need to have a screen to view the image as you simply view it through the lens of your telescopic sight. Mounted behind your scope usually means that you need a screen or display to view the image. The advantage is that you use the magnification of your optical scope before it hits your thermal sensors. The weight might be higher on this setup but you could end up with a better overall image. ​Click here now to check the lowest price on Amazon for the NiteSite Eagle. Both these setup types require a lot of length on your rifle. That’s usually not a problem with most guns but you will run out of real estate on a short barreled rifle with a short rail. You can use either design and permanently mount it on the weapon. The standalone design has the advantage that the optics are in sync with the thermal sensors. 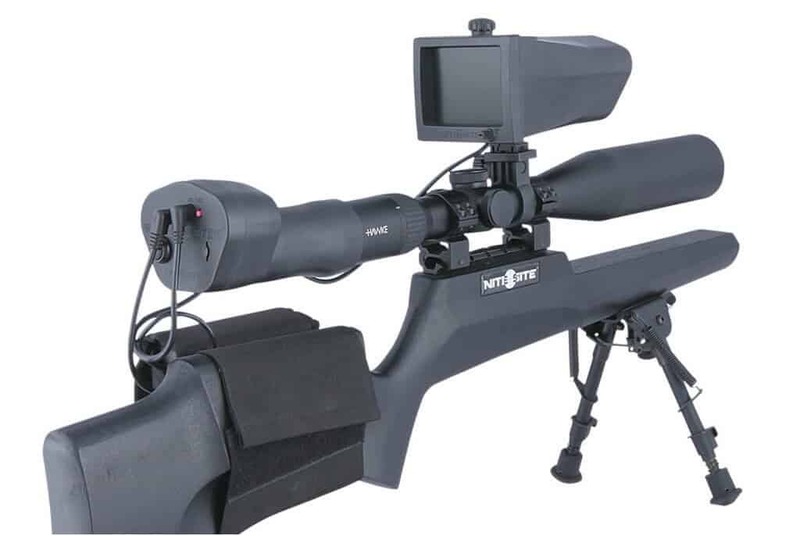 The attached system often uses the superior optics of a telescopic sight. Plus, you can take the added on sight off during the day to shoot like any regular scope. You should consider what kind of sight you prefer and whether you need to be able to dismount the thermal sight. If you only want a thermal sight then an integrated system would make more sense. Otherwise, you want to go with the attached variant. In any case, if you have a rail that is too short to attach both scopes then a gunsmith will be able to add an extension to your rifle. That way you can mount the thermal sight easily and reliably. Depending on the type of rifle and the type of thermal sight you can have a very easy or somewhat harder time mounting the sight. Using a standalone design replaces the daytime scope. That way you simply use the existing rail on the rifle and won’t have to worry about it. Using an attached system can end up with some challenges. If you use a front attached sight then you need additional rail forward of your daytime scope. A shorter rifle might not have enough rail-length and you might end up having to have a gunsmith add rail or you can use DIY systems like ​the Armasight Front Scope Rail System (FSRS). You can mount such an extension onto the existing rail. It also comes with scope rings. 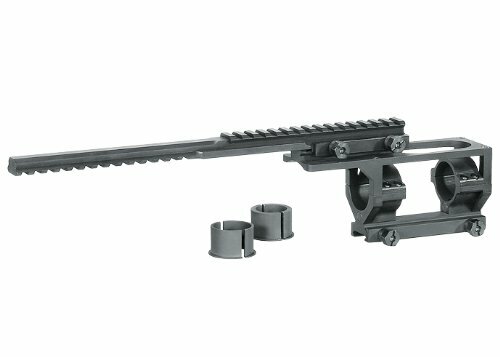 ​DIY options like these are usable but certainly not as robust and sturdy as a rail that is part of the rifle. They are sufficient for use in the non-tactical environment. Thermal weapon sights are getting more commonplace as the number of offerings increase and as they get cheaper. A few years ago they were only seen in the military and in science-fiction movies. Today they are more widely adopted by nuisance animal control, law enforcement and predator hunters. Newer offerings include sights that are integrated and that can be used in any light. They are still improving constantly to catch up with the capabilities of a good daytime scope. Add-on sights have been around a little while longer and they leverage your optical riflescope. They are cheaper as the integrated solutions. You also can simply remove them for daytime use and attach them for nighttime hunts. Another great advantage is that you can combine one such thermal sight with many of your daytime scopes and rifles. The technology will mature and get better over time. This will also be when pricing ends up in a range where many people can afford such a sight and start to use it. Until then it’ll be an interesting and expensive add-on for many and a necessity for a few.